When the time comes to your commercial kitchen, there are so many things to be aware of, and so many choices to make. The good news is that when it comes to choosing items that relate to your commercial kitchen’s air control and fire prevention, you don’t have to do it alone – you have the experts at Flue Steam right at your disposal. Our mission is to make sure your commercial kitchen is as safe and efficient as possible, so we offer a whole bunch of services to further that mission. 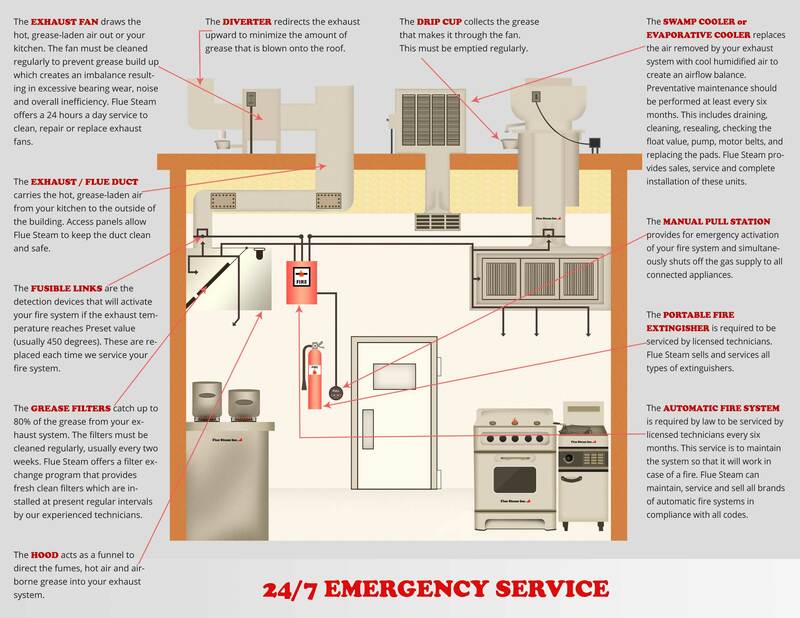 We have been in this business for multiple decades, and during that time, we’ve frequently added to our lineup of fire safety services for commercial kitchens throughout Southern California. If a fire arises in your commercial kitchen, we want to make sure you’re prepared to deal with it safely. That’s where fire extinguishers come in. When the time comes to pick out fire extinguishers for your commercial kitchen, you may not know exactly where to start. There are so many different fire extinguisher makes and models. But not to worry – we’re happy to advise you on the best fire extinguishers for your particular commercial kitchen as well as your preferences. We sell all types of portable fire extinguishers, plus we can help you decide how many to buy and where to place them in your commercial kitchen. 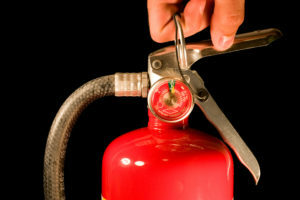 We’ll make sure your fire extinguishers are set up in compliance with relevant fire safety codes as well. Rest assured that you can trust our highly experienced, licensed technicians to advise you about and service your portable fire extinguishers. You’ll be able to be confident that if you ever need to use any of your portable fire extinguishers, they’ll be in perfect working order. By working with a licensed fire extinguisher company, you’ll always comply with the law, so that’ll give you real peace of mind, too. Begin your partnership with Flue Steam today by calling 800-700-FLUE. Let us make your routine easier and your commercial kitchen safer. We serve commercial kitchens throughout Southern California. So many commercial kitchen managers and owners have relied on us over the 48 years that we’ve been in business, and we look forward to establishing an excellent partnership with you soon. Call us at 800-700-FLUE today.